Lounge, delicious cocktails at your servica and at home!!! 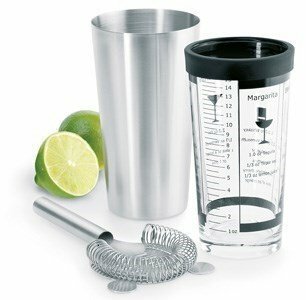 This set is perfect to prepare exotic drinks and fanatstic and delicious cocktails, just like a professional bartender. Free your inner bartender with the help of the Lounge shaker! This set includes a metal cup, a mixing cup and a strainer. It is perfect to make that delicious caipirinha on a hot summer day, or a deliciious gin after a long, hard-working day. Margarita, Daiquiri, Bloody Mary, Manhattan, Dry Martini, your favourite drink just a shake away!